Strong word of mouth helped Gravity to float to a modest 36 percent decline in its second week, enabling it to fend off newcomer The White Storm and land its second straight win at the Chinese box office. Still going strong in its third week, Gravity should have no problem surpassing $70 million, even in the face of heavy competition from new Chinese openers. This total would lock Gravity’s place as the 3rd biggest foreign release in China this year, behind Iron Man 3 and Pacific Rim. But it probably won’t be enough for the film to score a top 10 slot overall, as so many local films have performed well in 2013. 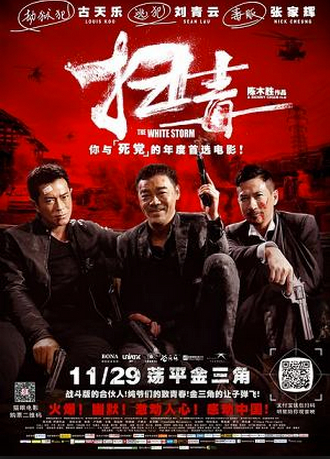 The Benny Chan directed action-crime thriller White Storm debuted to good but not great numbers, eking out a slim lead over Gravity during the past 3-day weekend, when they competed head-to-head. Blue Sky Studios’ animated adventure Epic fell far behind, mustering just $3.65 million in its 3-day weekend debut. The 7-month delay in Epic’s PRC release was undoubtedly a factor in its modest showing. Escape Plan will finish up its PRC run with an impressive $41.5 million, nearly double its U.S. total. Considering all the love China has shown in recent years for Sylvester Stallone and Arnold Schwarzenegger, the movie’s sexagenarian stars, it will be a good idea for Hollywood to dust off its old two-hander action scripts and re-set them in China for this dynamic action duo. For the first time since early September the weekly box office tally fell short of last year’s comps. Cumulative box office for the week ending December 1st saw a 7 percent decline to $58.5 million from the 63 million total in week 48 of 2012, when Life of Pi reigned. Today saw the long-awaited debut of director Ning Hao’s No Man’s Land, an adventure thriller that has survived two major revisions and six aborted theatrical release dates over the past four years as DMG, CFG, Galloping Horse and the filmmaking team struggled to conform to the SARFT censors’ restrictions. Originally slated to release in 2010, the film stars the hugely popular Huang Bo and Xu Zheng, who co-starred in last year’s megahit Lost in Thailand. With its excellent $3.5 million opening day, No Man’s Land should easily top Ning Hao’s prior personal record gross of $24.7 million for last year’s Guns ‘n Roses, though the director claims he doesn’t care how much the new film earns. Of course, what China’s theater operators would like is a big December for local Chinese pictures. With nearly 18,000 movie theater screens now in operation (35 percent more than at this time last year) and an average of 12 or 13 new ones opening every day, they are increasingly reliant on local films to help them pay off their investments. November’s box office totaled $250 million, a 36 percent increase over 2012, and cumulative year-to-date box office now stands at $3.22 billion. If December’s revenue merely matches last December’s total—a distinct possibility given the tough comps established in 2012 by Lost in Thailand—then China’s total for 2013 will wind up just shy of $3.6 billion. If, on the other hand, expected hits No Man’s Land, Personal Tailor and Police Story can each draw $80 million to $100 million in ticket revenue, then the year-end total could, just possibly, reach $3.7 billion. This entry was posted in Analysis, Box Office Reports and tagged Epic, Escape Plan, Gravity, Guns N' Roses, Huang Bo, Huayi Brothers, Life of Pi, Ning Hao, No Man's Land, Personal Tailor, Police Story, Rob Cain, Robert Cain, SARFT, The White Storm, Xu Zheng by chinafilmbiz. Bookmark the permalink.